The MacTutor history of mathematics archive. Other features . . .
Extractions: Mathematics in China Primary sources are Mikami's The Development of Mathematics in China and Japan and Li Yan and Du Shiran's Chinese Mathematics, a Concise History . See the bibliography below. Numerical notation, arithmetical computations, counting rods Traditional decimal notation one symbol for each of 1, 2, 3, 4, 5, 6, 7, 8, 9, 10, 100, 1000, and 10000. Ex. 2034 would be written with symbols for 2,1000,3,10,4, meaning 2 times 1000 plus 3 times 10 plus 4. Goes back to origins of Chinese writing. Calculations performed using small bamboo counting rods. The positions of the rods gave a decimal place-value system, also written for long-term records. digit was a space. Arranged left to right like Arabic numerals. Back to 400 B.C.E. or earlier. Addition: the counting rods for the two numbers placed down, one number above the other. The digits added (merged) left to right with carries where needed. Subtraction similar. Extractions: A Math Forum Project Mathematics has been vital to the development of civilization; from ancient to modern times it has been fundamental to advances in science, engineering, and philosophy. As a result, the history of mathematics has become an important study; hundreds of books, papers, and web pages have addressed the subject in a variety of different ways. The purpose of this site is to present a small portion of the history of mathematics through an investigation of some of the great problems that have inspired mathematicians throughout the ages. Included are problems that are suitable for middle school and high school math students, with links to solutions, as well as links to mathematicians' biographies and other math history sites. WARNING: Some of the links on the page in this site lead to other math history sites. In particular, whenever a mathematician's name is highlighted, you can follow it to link to his biography in the MacTutor archives. The Bridges of Konigsberg - This problem inspired the great Swiss mathematician Leonard Euler to create graph theory, which led to the development of topology. The Value of Pi - Throughout the history of civilization various mathematicians have been concerned with discovering the value of and different expressions for the ratio of the circumference of a circle to its diameter. The history of mathematics. 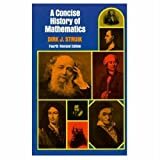 Mathematicians of the Seventeenth and Eighteenth Centuries , from A Short Account of the history of mathematics by WW Rouse Ball. Famous Problems in the history of mathematics Isaac Reed history of mathematics presented through some famous problems, with exercises and solutions. Extractions: Biographies in alphabetical and chronological order, and related resources on the Web. An ongoing project by students in math classes at Agnes Scott College in Atlanta, Georgia, to illustrate the numerous contributions by women to the field of mathematics. Included are the first Ph.D's in mathematics awarded to women (before 1930); and prizes, awards, and honors for women mathematicians. more>> "All numbers are not created equal; that certain constants appear at all and then echo throughout mathematics, in seemingly independent ways, is a source of fascination." Indulge your fascination, or discover a new one. This site provides well over a hundred constants, each with descriptions, proofs, interesting sidelines, and illustrations. Some are illustrated with Mathcad files (viewable with a free read-only version, linked from the site). Many entries rely on a knowledge of advanced mathematics. Browse the topic-based list or look up constants by numerical value. References and other links are cited. Links to Web Sites on the history of mathematics. David Joyce s history of mathematics Home Page http//aleph0.clarku.edu/~djoyce/mathhist/. The British Society for the history of mathematics. See the Newsletter page for contents list. Iraq the history of mathematics and the aftermath of war. Extractions: The British Society for the History of Mathematics HOME About BSHM BSHM Council Join BSHM ... Search The British Society for the History of Mathematics The aims of the British Society for the History of Mathematics are to promote research into the history of mathematics and its use at all levels of mathematics education. It does this through meetings, a newsletter and by other means. The BSHM takes in all periods and civilisations, and all aspects of mathematics, both pure and applied. Members come from a broad cross-section of those interested in mathematics, its history and education, and from many countries. Go down the page to the contents list or go to SEARCH facility This website can now be reached as http://www.bshm.org - the old address http://www.dcs.warwick.ac.uk/bshm/ will also work for the foreseeable future. BSHM members will be delighted to hear that Robin Wilson has been appointed Gresham Professor of Geometry and that Martin Campbell-Kelly has been appointed to a personal chair at the University of Warwick. 1986 The first issue of the AMUCHA The African Mathematical Union s Commission on the history of mathematics in Africa was presented. Extractions: A Modern History of Blacks in Mathematics On this web page we consider a contemporary history of Blacks in Mathematics , not Who are the greatest Black Mathematicians? (for that click the question). Here you can learn about (and even before ) the first African Americans in the Mathematical Sciences , (for the First African American Women click) The First Africans , and Other Important Events in the past 300 years . For earlier periods in history see the web pages of Mathematics in Ancient Africa . For a history of African Americans in science read Kenneth Manning's article Can History Predict the Future? Benjamin Banneker (1731-1806) is often recognized as the first African American mathematician; however, ex-slave Thomas Fuller 's (1710-1790) and the Nigerian Muhammad ibn Muhammad 's (16-1741) activities predate Benjamin Banneker. None of these men had formal degrees. Charles Reason (1814-1893) was probably the first African American to receive a faculty position in mathematics at a predominantly white institution - Central College in Cortland County, New York. Yale University becomes the first United States of America institution to award a Ph.D. in mathematics. history of mathematics Web Sites. There is a phenomenal amount of material on the Internet dealing with the history of mathematics.